Summer time and the living is breezy in this sleeveless shell with built-in ventilation! An insertion of lace ladders from Barbara Walker's A Treasury of Knitting Patterns into a wide ribbing at the waist gives a touch of sexiness and will keep you feeling cool when things heat up. The top is knit in the round to the arm openings, then divided for the front and back which are knitted flat on circular needles. The simple lace stitch uses common decreases and YOs. The shoulder straps can be joined by kitchener stitching, 3-needle bind-off or sewing bound off stitches together. Your choice! 18 sts/24 rows = 4" in stockinette stitch using larger needles. ...slip 1 is followed by a purl stitch: slip as if to purl with yarn in front. 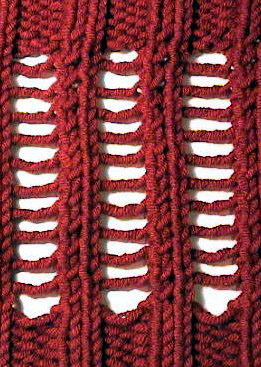 ...slip 1 is followed by a knit stitch: slip as if to knit with yarn in back. CO 150[160, 170, 180, 190] sts with smaller circular needles. Join, placing marker to indicate beginning of round and being careful not to twist work. Work in k2, p3 ribbing as follows: k1, *p3, k2* to 4 sts from marker, p3, k1. Continue ribbing for 0.5[1, 1, 1.5, 2] inch[es]. Work one decrease row as follows: k1, *p2tog, p1, k2*, end p2tog, p1, k1. Work in Stockinette Lace Ladder pattern for 3 inches. Work in k2, p3 ribbing as before for 2 more inches. Work to within 2 sts of marker indicating beginning of round and BO 4 sts firmly in purl, p1, k 52[62, 72, 82, 92], p2. You may either leave the remaining sts on the circular needle or place them on a separate circular needle or spare piece of yarn. Row 1 [WS]: slip 1, k1, p to 2 sts from end, k2. Row 2 [RS]: slip 1, p1, k to 2 sts from end, p2. Decrease a total of 10 times, until there are 51[56, 61, 66, 71] sts remaining, then work Row 2 as before [no decreases] for 1 inch more. On next RS row: work 20[22,24,26,28] sts, BO next 11[12,13,14,15]sts in purl, work remaining 14[18, 22, 27, 31] sts. Row 2 [WS]: slip 1, k1, p to end. Continue to decrease in this manner until 10[12, 14, 16, 18] sts remain. Work over these sts without decreasing until work measures 17.5[18, 18.5, 19, 19.5] inches from cast on row. You'll have to make a choice now about how you'll eventually want to attach the front shoulder straps to the back straps [3-needle bind-off, Kitchener stitch or seaming]. For the first two, slip the 10[12, 14, 16, 18] sts to a spare piece of yarn. If you plan to sew the straps together, bind off the 10[12, 14, 16, 18] sts. Row 1 [RS]: slip 1, p1, k to 3 sts from end, k2tog, k1. Row 2 [WS]: slip 1, p to 2 sts from end, k2. Continue to decrease until 10[12, 14, 16, 18] sts remain. Work over these stitches without decreasing until work measures 17.5[18, 18.5, 19, 19.5] inches from cast on row and slip to spare yarn/bind off as for previous strap. Return to the unworked undearm stitches and reattach yarn. Bind off first 4 sts firmly in purl and work back as you did for the front. Attach front to back shoulder straps by Kitchener stitching or a 3-needle bind off or sewing bound off edges together. You may also want to single crochet by picking up stitches in the slipped stitch edging around neck and arm openings to add more stability and correct any tendency for the edges to roll. Theresa has just started her first job in Norway and her knitting productivity has taken a nose dive. 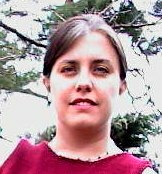 Pattern & images © 2003 Theresa Vinson Stenersen. Contact Theresa.